Additional Photos Here I departed Lawrence, KS by mid-morning with an initial target of Fairview, OK. Meeting up with Magliocco, Fritchie, Currens, and Pietrycha, we adjusted south towards Weatherford, OK as the surface cold front sagged southward, winds backed with time across SW OK, and aggravated cu developed within the better instability and convergence. Two storms developed and visually the storm SW of Cordell appeared more mature with lowered scud under the updraft base and thick/crisp anvil edge. We meandered east of Rocky on a few back roads and observed a significant improvement in the storm structure just before sunset. Perhaps the most memorable moment of the day came as the sun set directly behind the striated updraft complete with very pleasing vault structure and a well separated precipitation core. 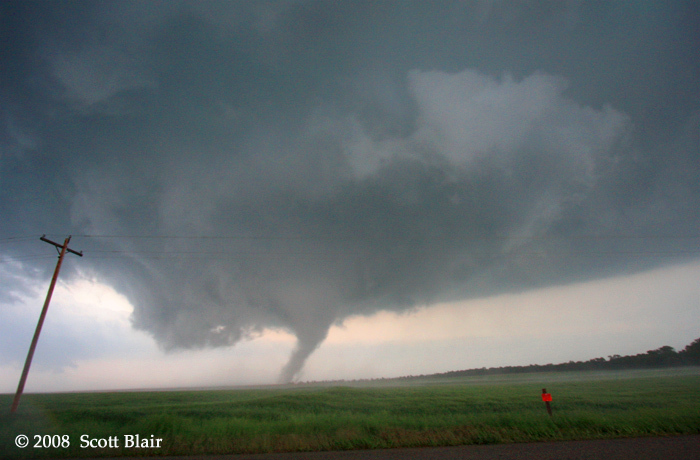 The storm occasionally managed to ingest blocky scud into the base with slow rotation. Continuing on back roads, we stopped east of Lake Valley, OK (5 N Mountain View, OK) and watched the rotating updraft approach. 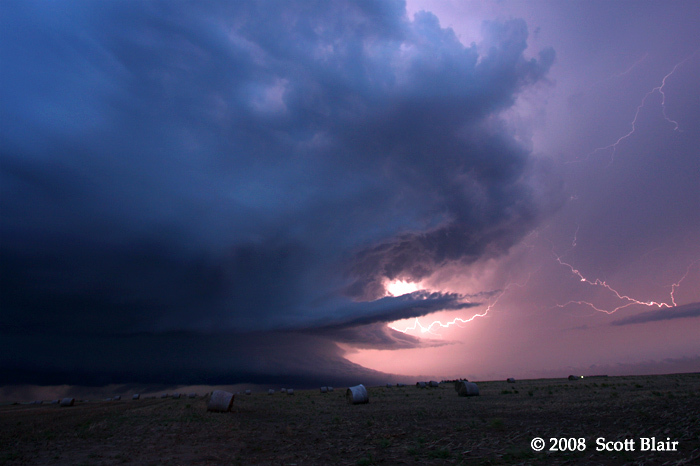 A spectacular sight came as the circular updraft passed overhead with the glow of twilight. It was possible to acquire a 360 degree view by looking upward with peripheral vision, which was an unusual and memorable treat. On the way back to the hotel in Weatherford, we spent an hour observing a third storm near the Corn/Colony, OK area. Heading north on Hwy58, we encountered hazardous driving conditions in the wake of the aforementioned supercell. Several areas of flash flooding and 2-4” deep of quarter-sized hail were common in a ~3 mile stretch. Overall, my expectations for the day were easily exceeded and happy to have the 2008 season underway. I started the day in Weatherford, OK with Amos M as we awoke to ongoing severe convection just east of our location. This activity was along and ahead of a cold front in a weakly capped atmosphere. Vertical directional turning within the first 5K ft close to the surface boundary wasn't good, but the speed shear was decent, providing hope of a few photogenic supercells by early afternoon. I observed two supercells, neither being very photogenic. The first one near Lindsay, OK quickly became undercut by outflow and remained persistent but elevated. Dropping south to a new storm west of Davis, the storm continued to fight new convection within its inflow region. The day ended south of Davis watching 1" hail stones. Additional Photos Here I departed northeast Kansas by early morning with an initial target of Lawton, OK. Meeting up with Fritchie/Rachael in OUN, we had the lunch of champions at Raisin' Canes. 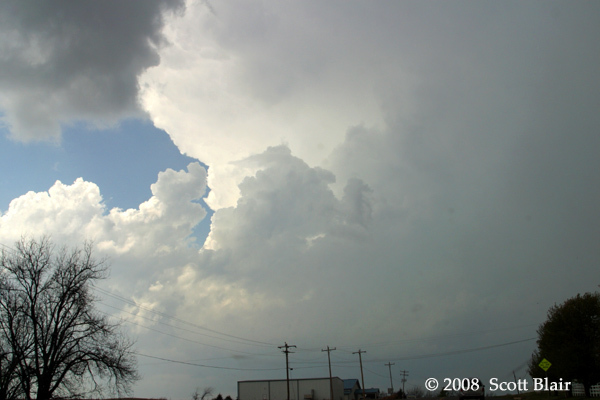 While in Lawton, enhanced cu persisted across far NW TX and we drove southeastward to acquire an improved view. Shortly after our arrival, three cells merged into one large updraft and rapidly formed a large wall cloud. 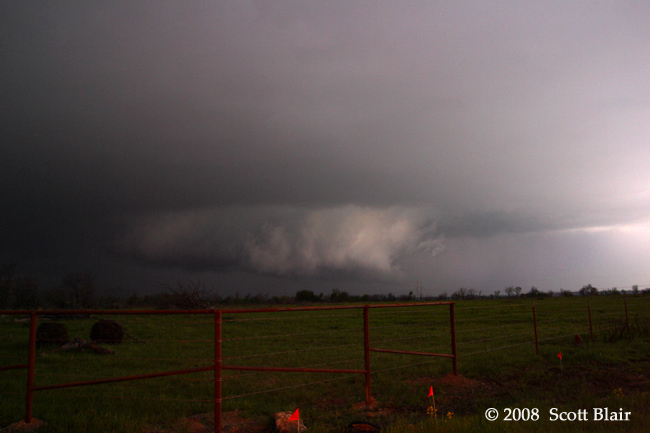 We met up with Magliocco and watched the rotating wall cloud near Electra, TX with golfball sized hail. 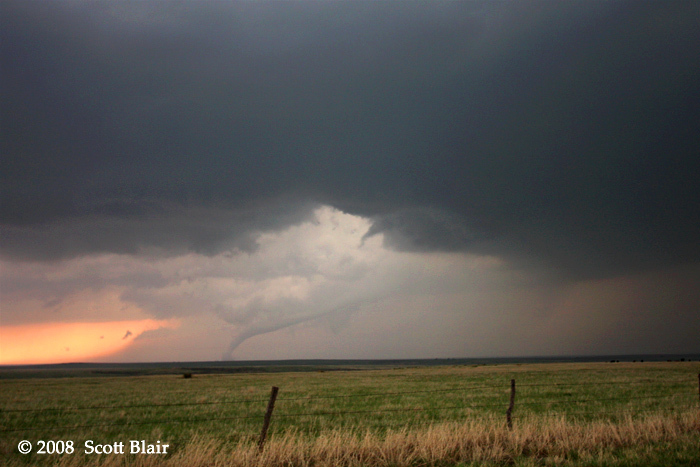 Sliding just south of the forward-flank precipitation, we watched a spectacular evolution of visual tornadogenesis. The storm structure was amazing and a tornado was noted in the form of two well-formed laminar funnels (5:01pm and 5:07pm), one complete with a debris whirl. I'm still unsure how the storm failed to produce a longer lived tornado as visually everything seemed in balance and mobile mesonet observations suggested the thermodynamic profile was very supportive. 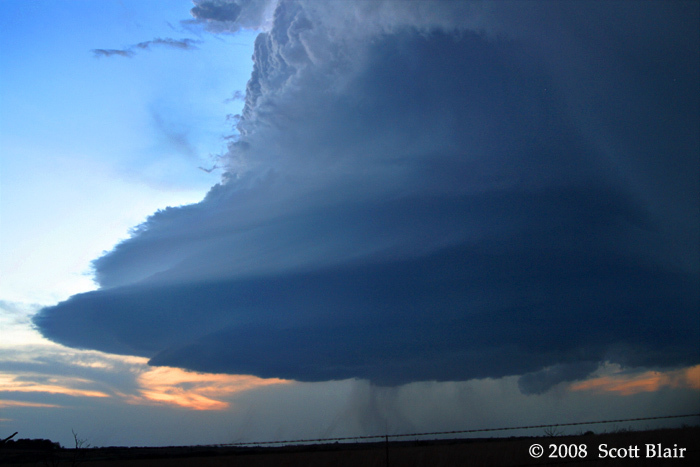 After the tornado, the supercell took on a painfully slow decay and we dropped south to a new storm near Mankins, TX. 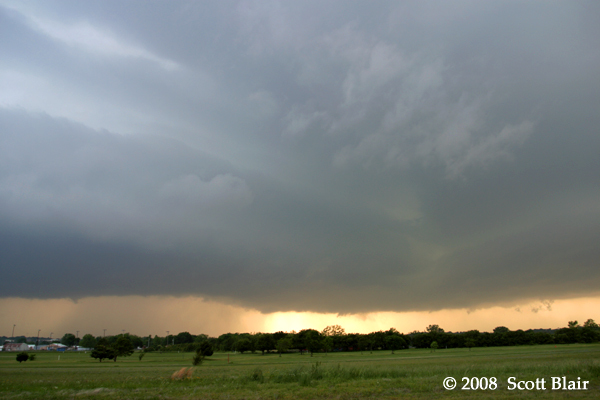 The third supercell had breathtaking structure near Windthorst, TX at twilight. 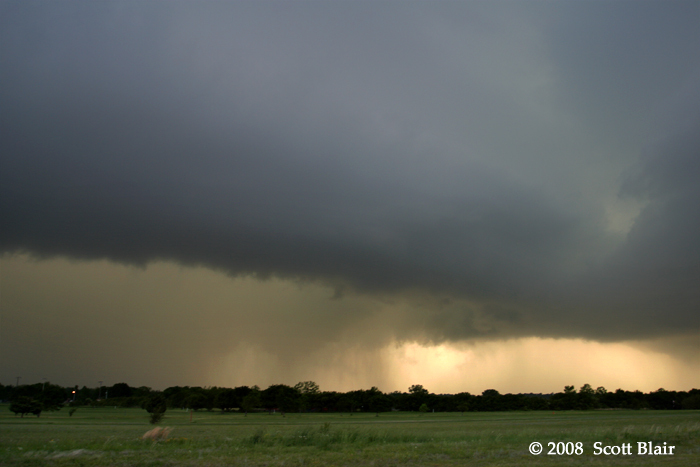 The storm evolved into more of a LP supercell as it slowly decayed. Departing Denton, TX by mid-morning with Magliocco and Hall, we made an initial target of Abilene, TX. We waited around the Sweetwater to Abilene area to monitor the warm front and dryline potential targets. Fritcie made it to our location just before convective initiation, and we took off after a storm approaching the Abilene area that looked to remain in a favorable trajectory to remain in the warm sector, riding along the warm front. The storm was rain-happy with an overload of precipitation masking storm structure and limiting anything photogenic. Fritcie and I flanked the supercell on I-20 to Hwy 183. As the storm neared Breckenridge, we turned east on Road 576 (4 S Breckenridge) and then north on Road 207. We managed to place ourselves on the western periphery of the new region of rotation (the tornado region near Breckenridge was occluding). A thin band of precipitation rapidly wrapped around us and the rotation. The cloud base motion quickly increased and a well-focused region of rotation materialized near Hwy 180. 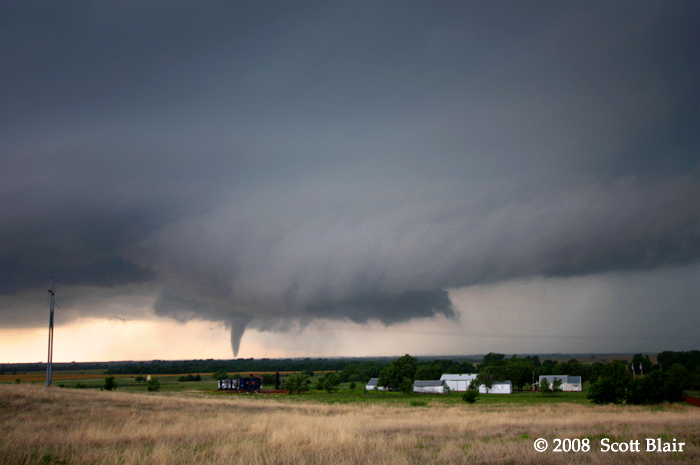 Around 5:33 pm, a tornado developed 12 E Breckenridge with periodic condensation from the cloud base to the surface, although no fully condensed vortex was observed. A modest debris whirl persisted underneath the lowering just north of Hwy 180. 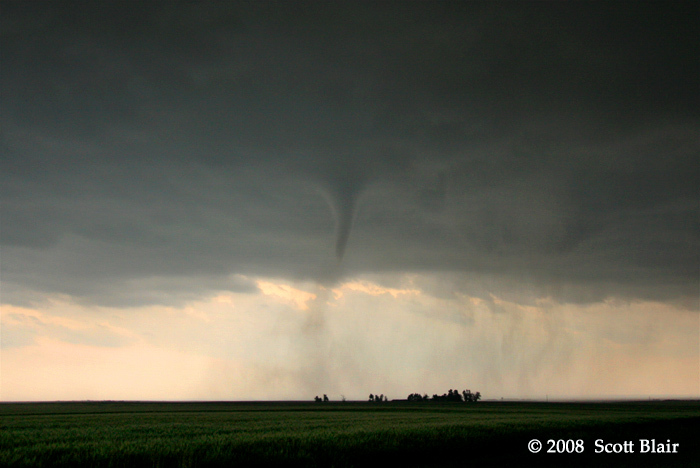 We managed to observe the tornado for no more than 3 minutes before the entire region was obscured by precipitation. We attempted to view the storm several times within the notch but failed each time. We ended the day with friends at Luigi's in Denton, TX. 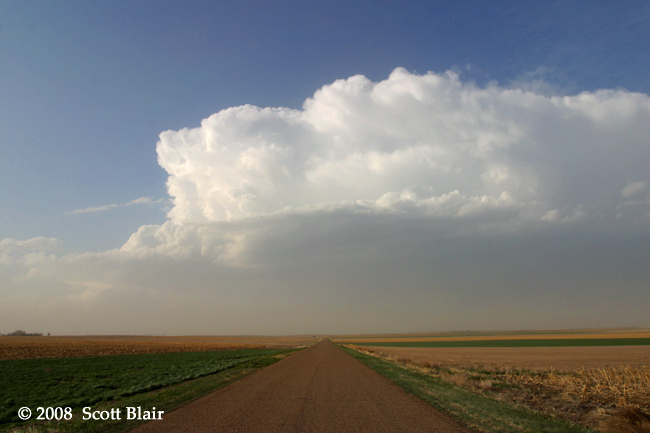 Overall, played a risky target across far eastern Colorado versus western Texas. Nice dry slot provided ample surface heating and moisture recovery at the surface sent middle 50 dewpoints into the high plains. The vertical wind profile was very conducive to supercell storms and the low-level shear was modest. I stopped in Wray, CO and met up with Pietrycha, McGuire, and Foltz from WFO GLD. We watched several high-based turkey towers develop just west of the deeper moisture. The KGLD radar showed an impressive fine line differentiating deeper moisture (upper 50s / lower 60s Td) and strong easterly winds (40 mph+). Unfortunately, this was generated from morning convection and characteristic a very stable layer. Supercells developed as the boundary interacted with this feature, resulting in explosive development above the stable layer. As they evolved, the convection consistently became even higher-based and slowly decayed. We ended the day dodging tumbleweeds, eating a steak, and watching a left-split storm near the CO/KS border at sunset. Additional Photos Here I departed late in the afternoon from WFO Topeka after a busy shift forecasting for severe weather. Several small storms quickly evolved from an effective dryline across portions of eastern Kansas. I managed to observe two severe storms near Pleasant Grove and Ottawa, experiencing severe hail of 1.25" and 1.50" respectively. Eventually, several smaller storms developed within the vicinity along the dryline and seeded downstream convection, so I dropped southward towards the southern end of convection in southeast Kansas. 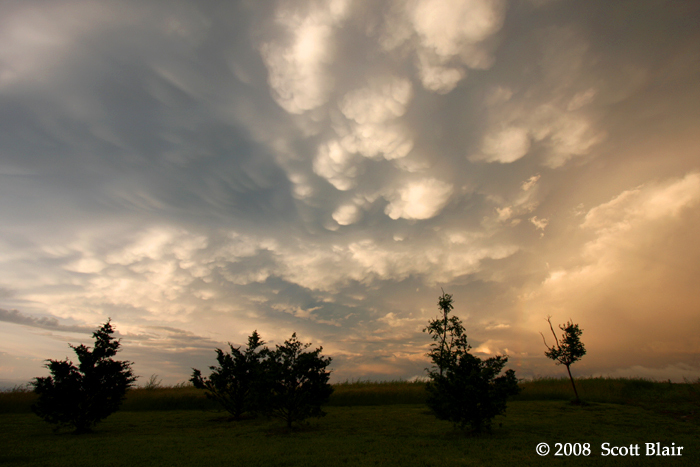 While approaching the main area of convection near Chanute, a beautiful sky of mammatus littered the underside of the anvil. I stopped 11 E Chanute, KS around 7:40 pm and waited for the tor-warned supercell to move closer to my location. The structure was very pleasing and the setting sun added to the mixture of colors. I drove eastward on Hwy 54 and stopped near Uniontown, KS. A newly tor-warned storm was approaching from the southwest. Through the semi-frequent lightning, a well-defined wall cloud was observed underneath the rain-free base. The feature was persistent for nearly 15 minutes and appeared to have decent potential for a tornado. I observed one final supercell near Mound City, but this also met a rapid demise after ingesting a worked-over environment. A robust squall line developed just west of Topeka, and I stopped just west of Lawrence for a few stills. After a few wind gusts around 60 mph, I called it a night. Additional Photos Here I departed Lawrence around 12:45pm for an initial target of WaKeeney to Ness City, KS. Expectations for the chase were relatively low, although I hoped there would be sufficient shear to sustain organized convection. High-based storms initially developed west of the dryline in southeast Colorado near Lamar. 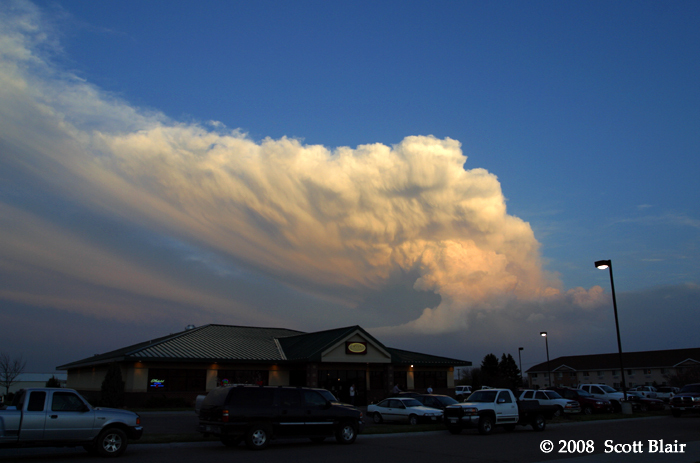 I arrived in Ness City around 4:30 pm with a view of convection to the west. Shifting east on Hwy 96 towards Rush Center, a cluster of storms had organized nicely and the first signs of decent outflow structure were visible. 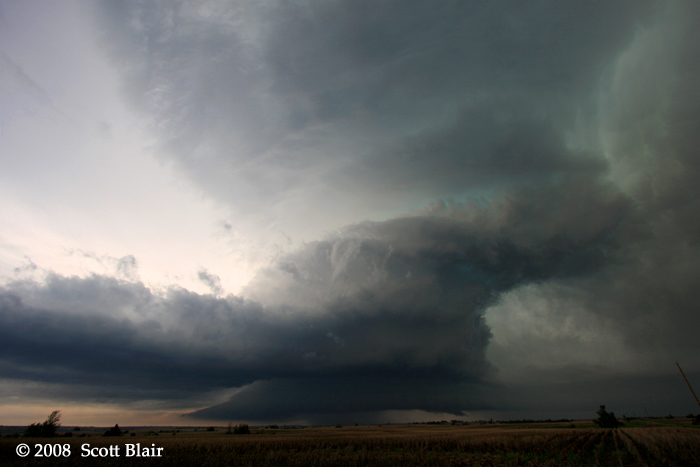 Storm structure drastically improved by 7pm as the storm evolved into a well-organized bow echo west of Great Bend, KS. With the visual apex of the bow targeted just south of GRB, I dropped 5 miles south and eastbound to Raymond, KS. 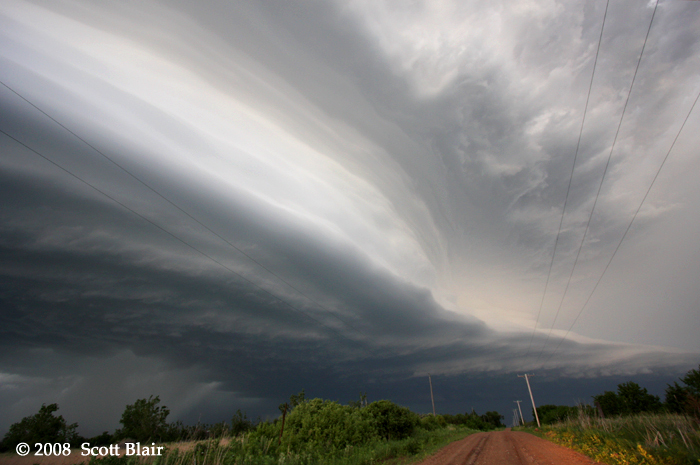 At this point, the shelf was making serious ground on my location, so I made intermittent stops to snap a few photos. The most impressive storm structure was viewed from 7:45pm to 8:15pm in the vicinity of Lyon. 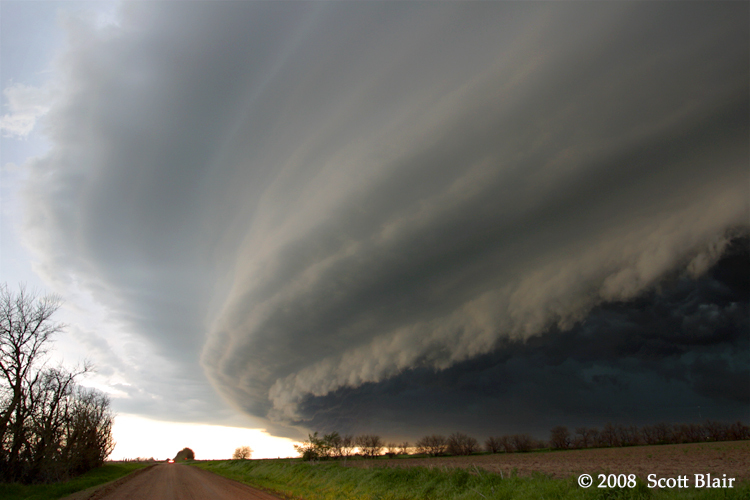 The shelf cloud featured a multi-layered appearence across the western horizon. Severe wind gusts of 60 to 70 mph were reported within the bowing segment. 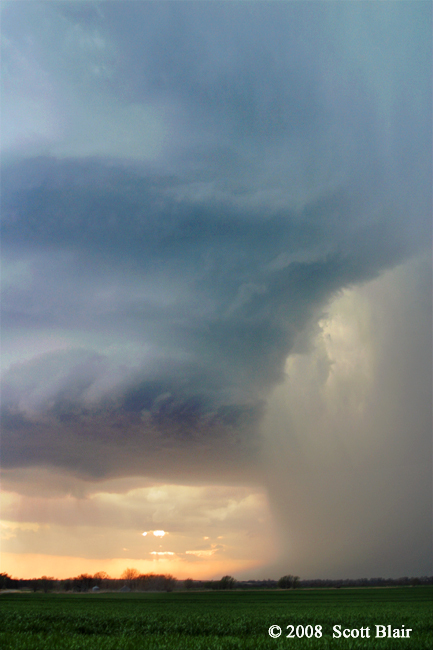 I allowed the leading edge of outflow overtake me east of Lyons, with the structure featuring a classic 'whales mouth'. I took a few more photos and called it a day as darkness set in. Briefly met up with Deroche waiting for CI. When convection failed to organize in a timley manner, Deroche had to depart for a operational shift. Later, I observed a supercell near the Castle, OK / Okemah, OK vicinity. Decent structure with several inflow tails feeding into the updraft. Around 7:35pm, a concentrated area of cyclonic cloud-based rotation developed a few miles west-northwest of Okemah. The rotation visually became fairly significant around 7:40pm, both visually and within the notch on the 0.5 deg base Z/V. The precipitation core immediately to its south began to wrap around the circulation. As this occurred, rotation further tightened and condensation tentacles began appearing near the center axis. As the rain began to obscure the area of interest, condensation rapidly condensed into a tapered cone-like feature. With its location relative to the storm and strong persistent rotation, I suspect this was a brief tornado (~7:40pm, 2 WNW Okemah, OK). 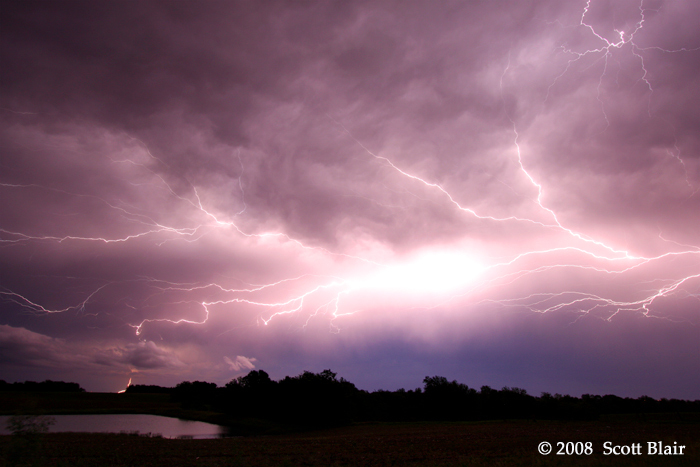 Enjoyed the lightning show as I drove to Denton, TX. Deroche, Burtis, and I departed GLD midday for an initial target of Scott City, KS. Met up with Pietrycha and we watched several storms spin their way north-northeast from Scott City to I-70. We spotted a wall cloud to our southwest from I-70 south of Grainfield. The feature persisted and an elephant trunk tornado developed at 5:28pm and persisted for 17 minutes, becoming a long rope at dissipation. We dropped south to a new storm south of Collyer. 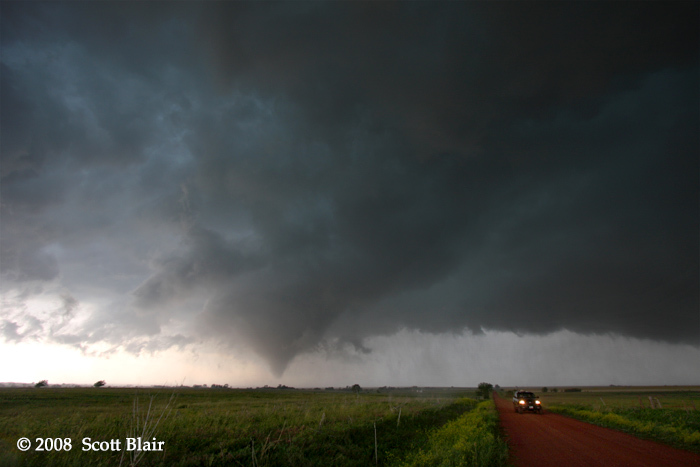 We observed two tornadoes simultaneously at times; a skinny cone with a debris whirl and another tornadic region that evolved from a dust bowl into several condensed tubes. As the storm approached, we fled eastbound on I-70 and stopped to allow a new region of violent rotation pass to the west. The fourth tornado developed just south of I-70 with a near continuous debris whirl underneath intense rotation. 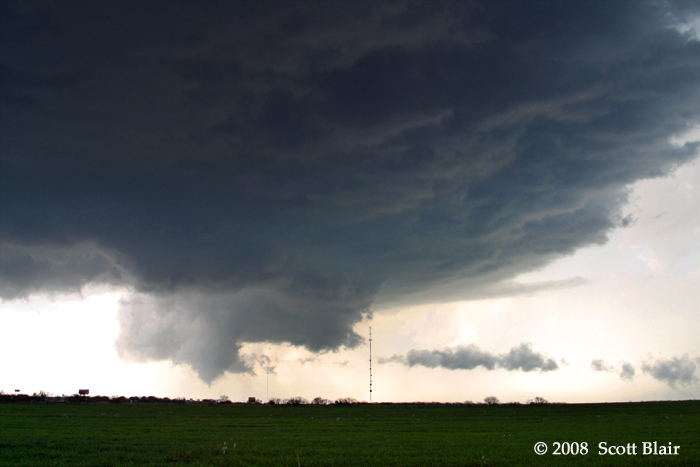 Occasionally, a cone would condense underneath the central axis of the wall cloud. We ended the day in HLC as the storm passed just to the west and north of town. Had a good dinner meeting up with Magliocco, Fritchie, Currens, Eubanks. Chased with Deroche and Burtis for the majority of the day. Observed the stovepipe transitioning into a wedge north of I-70 near Quinter. Figuring the outflow boundary location, I dropped south and watched a 5 min long elephant trunk tornado develop and rope out with a nice debris whirl. Third tornado developed on the bulge of RFD occlusion consisting of a ~2 min long narrow cone with small debris whirl southeast of Ransom. 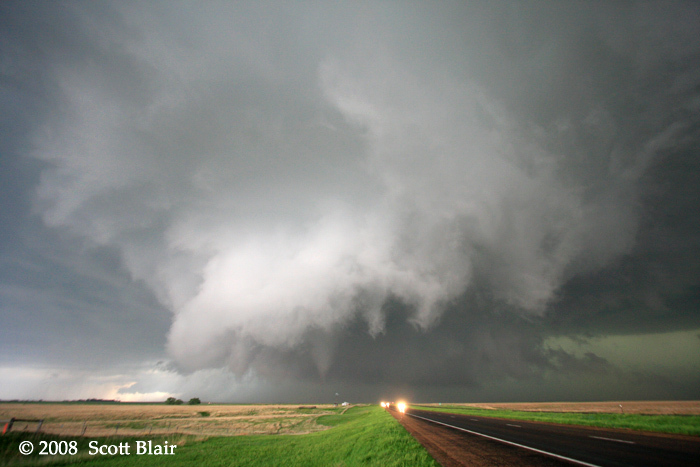 Fourth tornado occurred as a strong region of rotation was beginning to visually occlude east of Ransom, with the tornadic region crossing Hwy4. 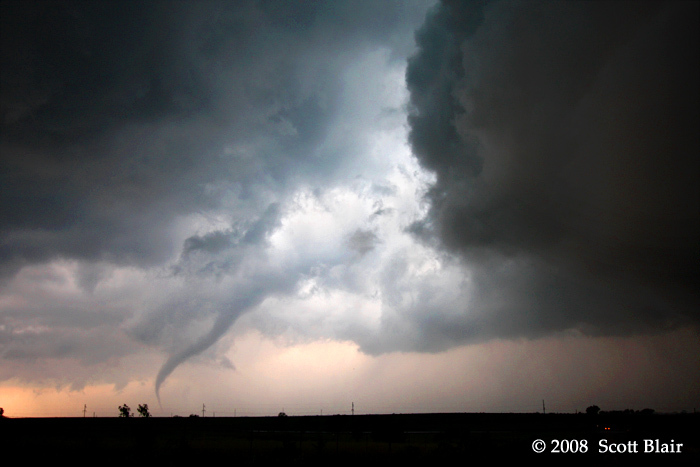 A new meso developed once this tornado wrapped in rain. A large (1/4 to 3/8 mile wide) and persistent tornado developed from this new meso south of Cedar Bluff State Park. This tornado eventually wrapped in rain and crossed I-70 west of Ellis with numerous power flashed illuminating from the rain curtains. 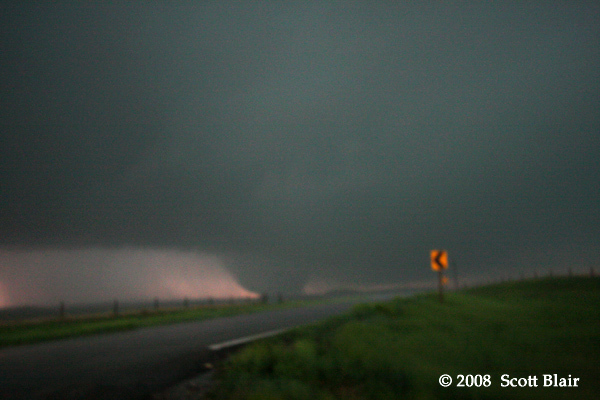 The final observed tornado occurred just south of Ellis with power flashes along the south side of town, eventually forming a narrow cone. Visibility and available light were many times compromised and likewise not the best photo day. After a dinner stop in HYS, ended the day with power outages and crappy internet in SLN. Observed a slow-moving, long-lived supercell with at least 6 tornadoes across north central Oklahoma. Deroche, Burtis, Magliocco, Eubanks, and I departed Salina, KS with a target of the dryline/outflow boundary intersection. We acquired our first view of the rain free base by early afternoon near Bison, OK. An elephant trunk tornado developed well-separated from any precipitation core, lasting ~5 minutes roughly 6 WSW Douglas. Meandering near Douglas and south of Covington, we noted several more tornadoes including a healthy cone with a strong tumbleweed-filled RFD. We observed a beautiful updraft occlusion and tornado 9 SW Perry for ~10 minutes. 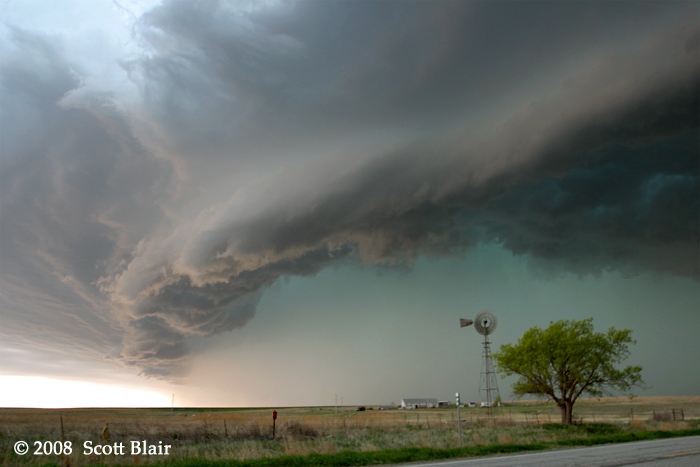 It was interesting to note the supercell transition from very classic to wet classic as it evolved. We found an excellent diner near Morrison, OK which made missing the final tornado much less painful. 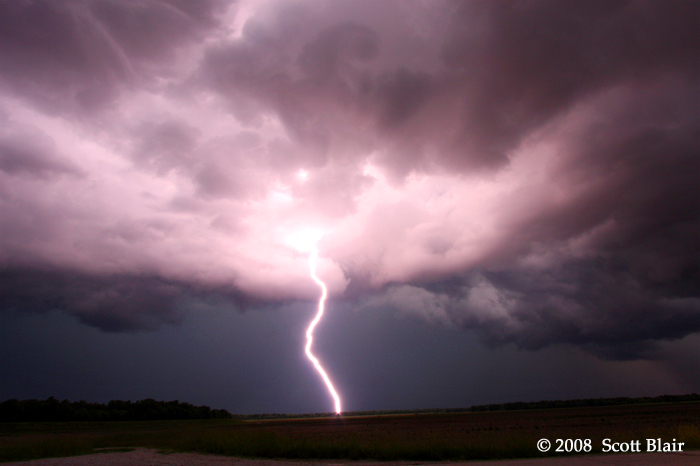 Deroche, Burtis, Pietrycha, Currens, and I departed DDC and jumped on a robust storm north of Kinsley. This storm met a quick demise and spewed 1.25" diameter hail in advance of the main precipitation shaft. Repositioned near Haviland and observed a nice updraft and inflow tail with a tor-warned storm. New convection was eventually ingested and the storm slowly became much less organized. Figuring the numerous new convective updrafts within the warm sector would provide a low probability of persistent organized convection during the early evening hours, we ended the day in Pratt and drove to Medicine Lodge for dinner. We learned of the tornadoes we missed while eating in Medicine Lodge. Frustrated, we started the drive to the hotel in ICT. 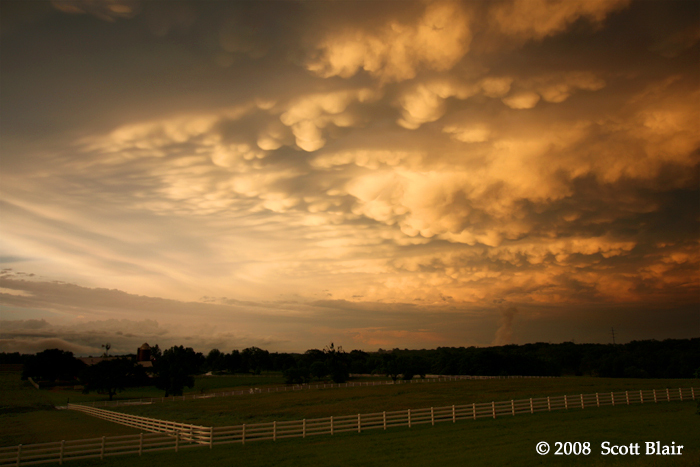 Along the way, a beautiful sunset illuminated pockets of mammatus clouds in a fiery orange contrasted with blueish low clouds. We made an excellent decision to pull off the road and enjoy a simple, yet so satisfying piece of the chase day. It seems like modest moments such as this are good reminders why I love meteorology and chasing, even after the chaos and frustrations of missing 'the event' of the day. Started the day in Kearney and jumped early on the supercell near Elwood, NE. Chased/ran into several folks during the course of the day including Deroche, Burtis, Pietrycha, Magliocco, and Fritchie. We followed the storm for a couple hours, stopping a few miles east of Kearney. We observed a tornado underneath a bowl-shaped lowering with a few power flashes and dust whirl near the town of Kearney. 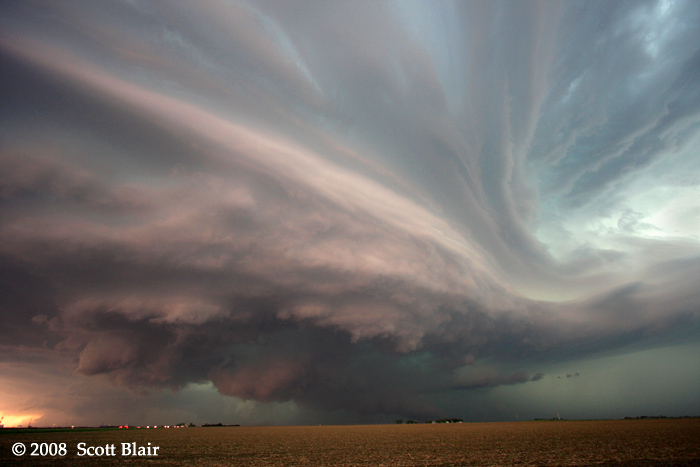 The storm structure was quite impressive with several well-defined structure characteristics. As the supercell trended to HP, we explored our options and shifted southward to convection in far northern KS. We targeted a persistent supercell east of Osborne by 8pm. Shortly after, we observed a 30 minute multi-vortex tornado south of Glen Elder, KS with awesome rotation and an assortment of shapes and sizes. 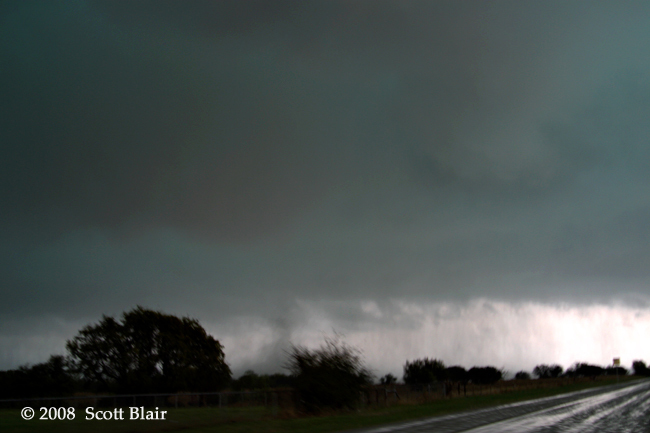 The tornado became rain-wrapped and darkness set it as we ended the chase day near Scottsville. Departed Little Rock during the mid morning hours will a broad initial target of northwestern Missouri. A well-defined shortwave trough was expected to lift across the central plains with a stationary surface front stretched over northern Missouri. Low level cu rapidly increased by mid afternoon and I jumped east of the KC metro area just before rush hour traffic to observe two stout updrafts. 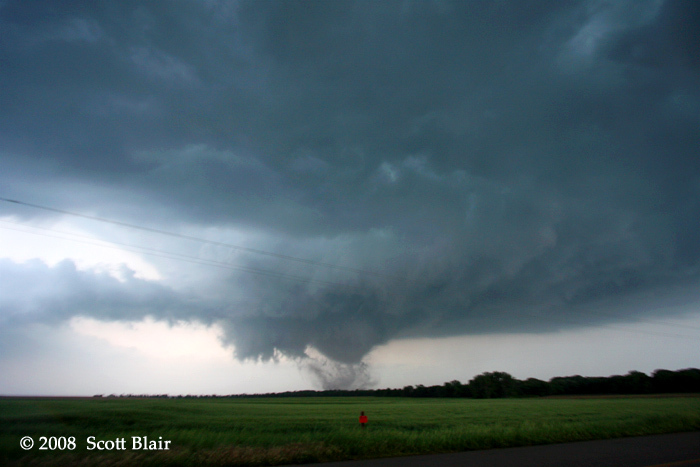 A supercell eventually evolved and I watched a well-formed wall cloud and vault region near Polo, MO. Low level inflow winds were somewhat weak and it appeared the storm struggled with its outflow for the majority of its multi-hour life. I stayed in the car for the majority of the chase after a ridiculously close cg lightning strike occurred while out of the car. As the storm shelfed out at sunset, this and upstream convection produced brilliant anvil crawler lightning near Bosworth, MO. Original forecast target of NC Kansas busted and readjusted to SW Nebraska to observe three supercell storms. Met up with Deroche, Magliocco, and Burtis for the majority of the day. Initially intercepted a storm near Elwood, NE but it quickly became outflow dominant and served little in the way of photogenic opportunities. Fearing a cold pool was beginning to stabilize areas along and south of I-80 from ongoing convection, we opted westward to investigate the persistent activity in NE CO / SW NE. Struggling with poor dirt road conditions, we waited for the storm near Hayes Center, NE to approach our location along Hwy 83 south of Maywood, NE. The storm featured nice structure including a barber pole updraft, but little in the way of organized low level rotation. 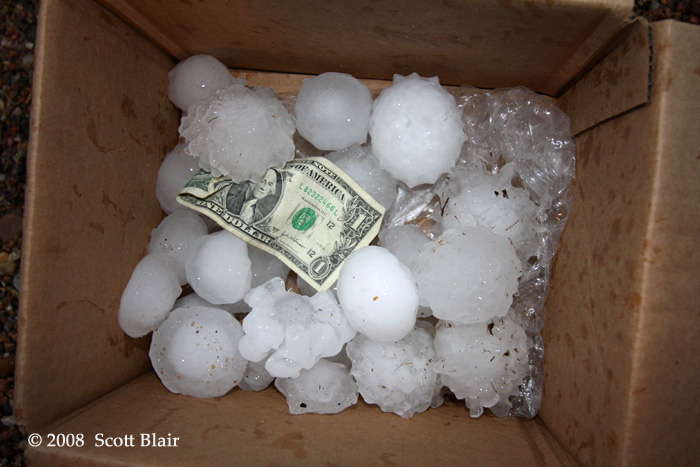 We assisted in verifying 2.50" hail in the vault region and forwarded our report via SN. 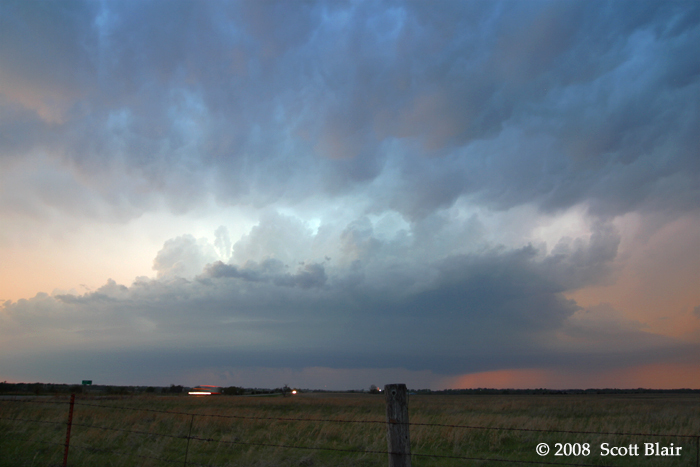 We observed a final supercell in the vicinity of the previous storm along Hwy 83 just after twilight. 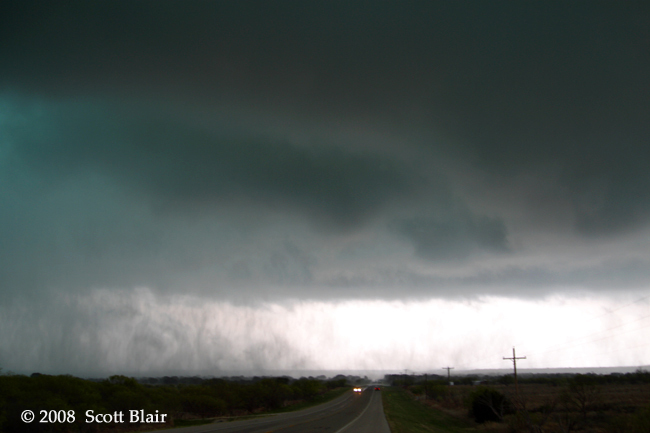 Storm structure was quite impressive with several long inflow tails trailing back into the main updraft region. Inflow winds were significantly improved compared to the previous storm. We observed up to 3.00" diameter hail with this storm as it crossed an abandoned Hwy 83. I initially had little intention of chasing, but an isolated storm rapidly developed by late afternoon within close proximity. A severe storm evolved west of Alma, KS and the upper levels looked visually impressive as I approached on I-70 from LWC. However, the environmental shear was less than supportive to sustain a significant storm and the cell met a quick demise as I arrived a few miles north of Alma. I was able to find a few quarter-sized stones within a mix of rain and pea-sized hail. 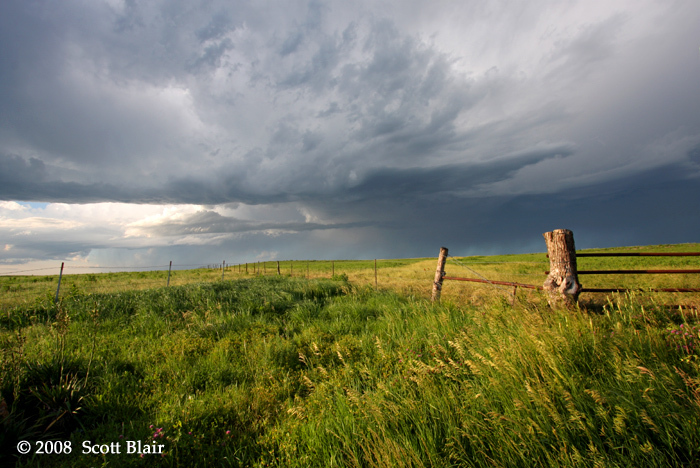 I met up with Deroche near Paxico, KS and we enjoyed the northern Flint Hills sights with a sky of scattered convection. While organized convection no longer occurred, we spend several hours taking stills of some very photogenic scenery. Deroche and I chased the initial supercell south of Susank, KS. Observed very rapid visual tornadogenesis at an uncomfortably close range 2 E Hitschmann, KS. 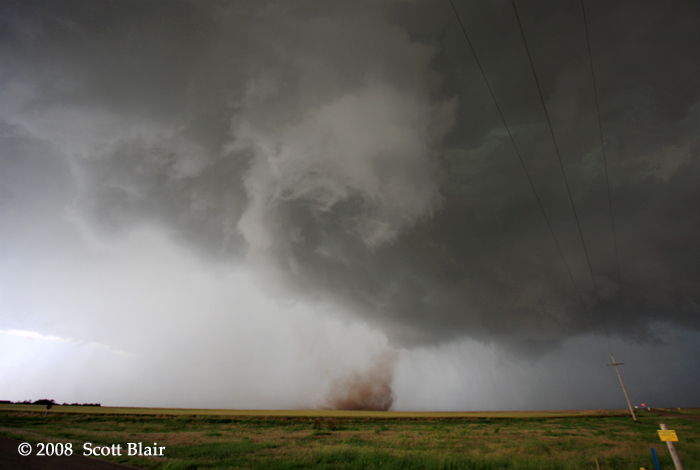 The tornado began as a well-organized dust whirl underneath rapid low level rotation. Multi-vortex configuration was noted along with power flashes and airborne trees limbs. 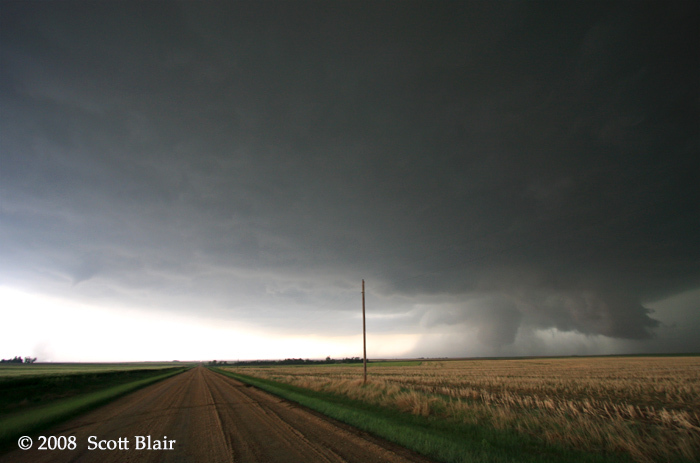 The tornado wrapped in rain, but remereged as a condensed cone tornado near the Barton/Ellsworth county line. Total tor time ~10 minutes. 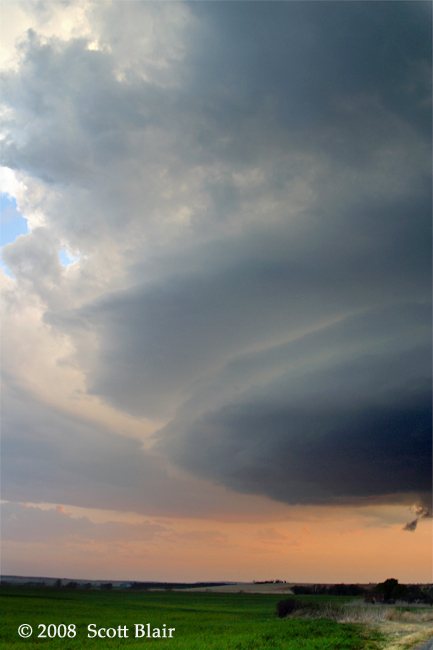 We later observed excellent structure with a second supercell near Holyrood just before sunset. We intercepted one final supercell and tornado along I-70 after dark near Chapman, KS. Numerous power flashes were noted as the strong (EF-3) tornado tracked through Chapman. 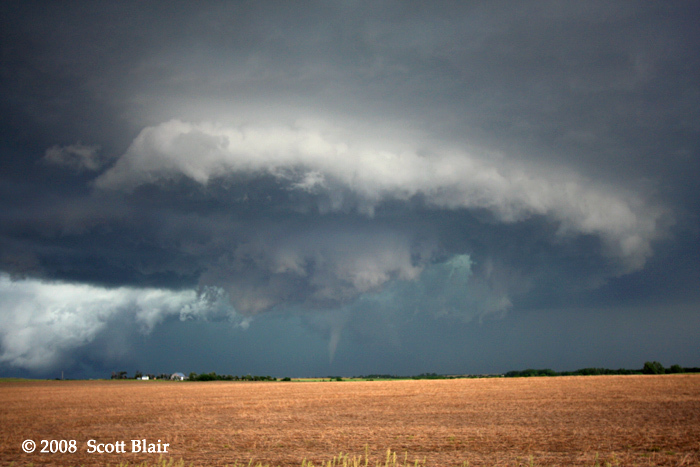 Photos and an in-depth summary of the Chapman tornado can be found by clicking here. Had little intention to chase this day as 1) exhausted from the numerous chase days, 2) didn't like the setup as it appeared to promote messy storms, and 3) expected to assist operations by coming in early. With staffing more than adequate, I decided to meander around the TOP/LWC region to observe several warned isolated storms. Failed to observe anything significant with the messy-looking convection. 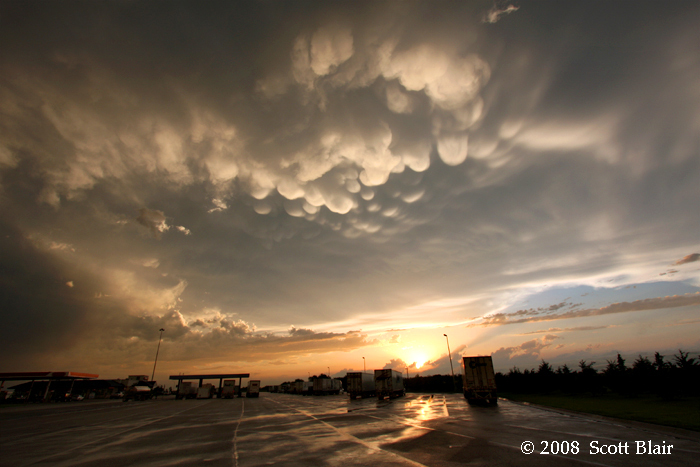 On the way to work, I was fortunate to have brought my camera as a beautiful sunset display of mammatus greeted motorists on I-70. 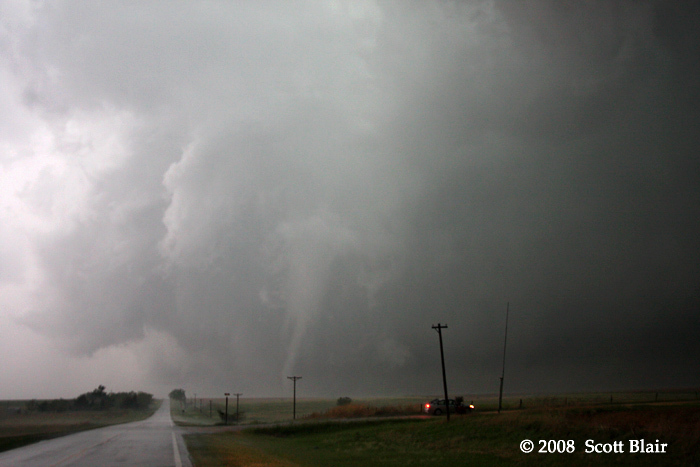 While I occasionally ventured out after 6/12, this was effectively the mental/physical end of my 2008 chase season. 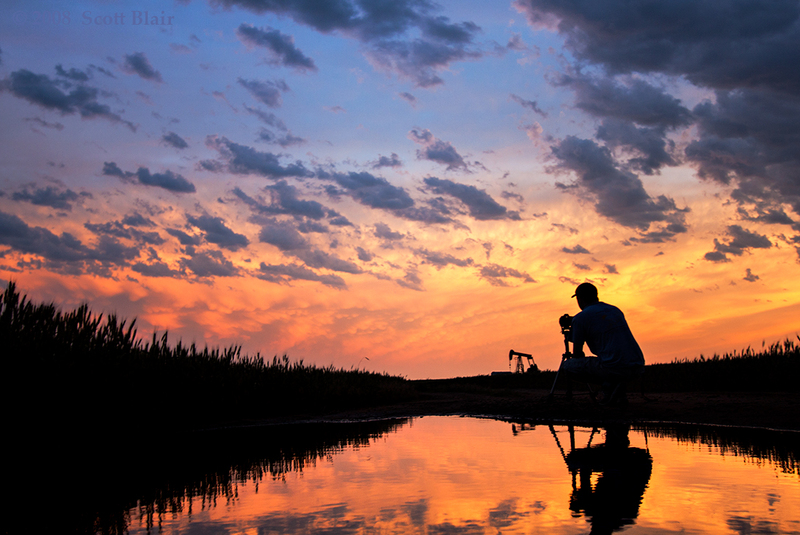 I took several stills, enjoyed the peaceful moment, and closed another chapter to a memorable season of storms and friends.